Dermatophysis or "ringworm" is a common, contagious, fungal skin condition in the horse. True dermatophysis is one of several species of fungus. Dermatophysis is over diagnosed because many people erroneously categorize any skin lesion as "ringworm". Symptoms include: hair loss, reddening of the skin, scales, crust, pustules, and sometimes these lesions form a circular pattern which has lead to the name ringworm. These are the same symptoms as most other causes of dermatitis; making diagnosis by visual examination impossible. Many cases will respond to broad spectrum treatment and a precise diagnosis is not necessary. I like to use chlorhexidine scrub to clean the area and remove all exudates. I then topically apply an antifungal, antibacterial, and in some cases a steroid to the affected area. Exact diagnosis may be important in refractory cases. Culture, cytology, and biopsy of the affected areas can be used to give us a definitive diagnosis and help direct treatment. Systemic antifungal medication such as griseofulvin or ketaconazole may also be useful in refractory cases. Treatment may take several weeks to finally resolve the dermatitis. Ringworm can be contagious to humans or other horses thru direct contact or sharing of tack. Transfer of the fungus is not common however because prolonged contact with the skin is required. To transfer ringworm from a horse to a human some of the fungus must get under a watch band or other clothing that grinds it into the skin. 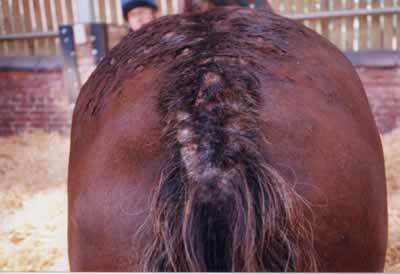 To transfer ringworm from horse to horse the fungus usually must get under some tack, this has caused some people to call dermatophysis "girth itch". The environment and tack can be cleaned with povidone iodine, 6% sodium hypochlorite (bleach), 5% lime sulfur, or 1.5 % copper sulfate.